Scarlett as Suffragette would fit with a pattern they've established, which is every edition so far has included Scarlett, Mustard and Green -- and Scarlett is the face of the game. Theoretically Irene Adler fulfills the green character color (or is that a "Meadow-Brook" green), so it's the first Green has not appeared named as such. We'll see if Mustard keeps his name, or if yellow is appropriated for another Sherlock Holmes character. Either way, if the card says Scarlett then she continues the pattern of having a Scarlett in every edition. Something else this does is change the names of the characters which is a new twist to the game. Presumably, these new characters will appear grouped with their color groups. The thing is, if they do that, it will be the first gender-bender character in that Irene Adler is a female character wearing green (unless they are introducing a new light green color for a future Mrs. Meadow-Brooke). So I'm curious to see if they update the organization scheme in preparation for some new future possibilities to the game. Otherwise, Sherlock will have to be grouped with one of the original characters color groups, as will Watson, Moriarty, Lestrade, Mrs. Hudson, and Mycroft. Last edited by Murder by Death on Fri Apr 12, 2019 3:19 pm, edited 1 time in total. I think the weapons teaser poster had a poster for "Scarlett the Sufragette"
Ugh. I hate the idea of using Sherlock characters, ESPECIALLY if Sherlock or Watson are included. Sherlock and Watson as SUSPECTS????? No. No. No. A thousand times no. 7. Prof. Moriarity (azure blue?) or Peacock if not Moriarity? The only problem there is the women and men aren't equal, which I guess is not possible with 9 characters, but still my list stands 3/6 at the moment. So they'd need to leave out at least one major Holmes character for a more generic one played by our current cast. Last edited by Murder by Death on Sat Apr 13, 2019 3:12 pm, edited 2 times in total. Mrs. Hudson as a murderess is almost as bad as Sherlock or Watson. PLEASE make it untrue. Oops! You're right. There is a Scarlett for Suffragette poster in the weapons reveal. I was busy looking at the weapons, I didn't think to look for clues for anything else. But, even if Green doesn't make an appearance, it doesn't mean anything. Maybe he's sitting this one out. We'll have to wait and see if there's a new suspect group for Irene Adler, which only makes sense as they would need one to balance against Rusty in the character selection lineup, going from 12 characters to 14. By the way your complaint is the problem with doing any old theme with Cluedo. GILLIGAN'S ISLAND works well with Gilligan as a victim and the other 6 as suspects, because who wouldn't want to kill GIlligan. But something like STAR TREK doesn't because, Capt. Kirk and the rest of the hero cast, are suddenly suspects of murder? I mean it's doable, but it goes against the grain of the characters. The alternative is not to use the main characters which is why someone would want to buy the edition in the first place. So then the premise has to change (like who ate the chocolate cake), which I suppose is fine too -- but not really why folks play clue. True - I've never been a fan of the themed Clue games... It's a silly concept to make a few bucks. There are definitely some that are better than others; ones that put time and effort into creating a plausible story or those that have characters dress up like the Clue characters - but by and large they're all rather silly... IMO. Pity to see Marmalade succumb to that. Is he supposed to be Mustard or Brunette? He’s wearing yellows and browns (with a blue ascot — or is that gray?) so more than likely he’s replacing Mustard, rather then Brunette (but I suppose he could also be Gray). He’s got a whole new face though. Again, the key is where these characters are placed in the suspect selection. I suppose it’s possible that they only make these characters available in the Sherlock theme, similar to how the weapons are locked to a theme, but that would be a big change to how the game is set up now. Last edited by Murder by Death on Sat Apr 13, 2019 3:38 pm, edited 4 times in total. I see her now, she’s in the lower left of the poster, not the right. She does appear female, and may be wearing blue, but could be gray, or even white with shading. Don’t know what the monkey has to do with Sherlock, but that possibly adds another female to the cast, in place of one of the recognizable literary male characters. I wonder if Black is taking the place of Moriarity in this game then? Should be an interesting reveal, only to raise more questions for the release and how the characters match up to the existing color groups. The one with the top hat on the upper right is Moriarty. Wherever did you get those Mr. Sterling Silver? So, Moriarity is gray/grey. Interesting. And Plum is Lestrade. Even more interesting. I’m a bit surprised Peach and Rusty are in the same game, and more than a tad disappointed there’s no Mrs. Hudson. At least this confirms Mrs. Meadow-Brooke with Watson in Green. Peacock is an odd one. So now the only mystery is whetherSherlock is Brunette or Mustard. EDIT: oh now I see why they have Peach and Rusty ... it’s the same reason they have Green with Meadow-Brooke. So there’s absolutely no doubt they’re introducing two new character colors. Last edited by Murder by Death on Sat Apr 13, 2019 5:47 pm, edited 1 time in total. That’s hysterical... yet they’re gonna roll it out over 11 days on Facebook like a mystery haha! What's confusing to me is that this set looks to be a mishmash of Sherlock characters, with classic Clue character. So some are retaining their classic names, while others are purely from the Sherlock universe. 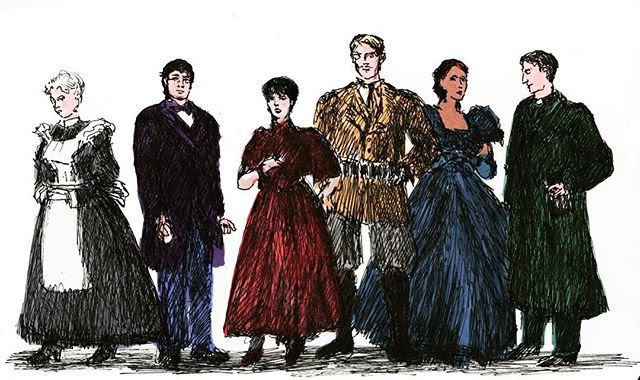 Going by color code - it looks like Sherlock is Mustard, Watson - Green, Lestrade - Plum (Though I thought it was Azure at first), Irene is what looks to be a Mrs. Meadow-Brook equivalent, Moriarty - Grey, and then Scarlet, Peacock, Peach and Rusty retaining their classic names I presume? I do like the nod to Nurse Peach, as a reference her early concept for the VCR game. Yeah, I was a little surprised to see them. There's also a shot of Watson/Green reading a newspaper, but it's small -- too small for me to make out the name of the newspaper (something "Journal") or the headline (something about illegal something caught on the Thames). And is that Dr. Black standing next to the car? I guess so. BTW, I think Sherlock is the Mustard character (it just looks to me more like the yellow they use predominantly for Mustard than the brown used for Brunette). And my first thought when I saw Peach is that she might be a reimagined/repurposed Molly Hooper until I remembered that Molly isn't a Conan Doyle character; she was created for the BBC series. Well there you have it then. I understand to add additional women, but why not go ahead and include the other Sherlock recurring favorites? Lestrade, Mycroft, Mrs. Hudson. Are these character types even typical of Sherlock Holmes novels? I do LOVE the artwork though. I can’t wait to see them all. The Museum, HydePark, Dark alley, newspaper press, all beautiful. The accusation stairs as the London Underground entrance is the perfect way to incorporate the entrance “hole” (for lack of a more elegant term). I imagine 221 B Baker Street will be among them. Well at least we have the remaining 5 locations to guess about until the game is finally released in about a week ... that and the board layout.